I was reporting last week that many countries in South Asia are facing water scarcity. And to recent articles I read, it seems that the phenomenon is also witnessed in China as well, but an even more worrying way. An article from the Green Leap Forward brings us great information on that worsening trend. This coupled to the economic turmoil creates a potentially explosive situation in rural China, as 20 million people are going back. The situation was already critical last year when I first wrote about that topic, but what I read really makes me believe that Jared Diamond was right on China. The “worst drought in half a century” affecting eight northern and central provinces dominated the past week’s news. A 90 percent drop in average rainfall since last November will affect 11 million hectares of wheat crops and create a drinking water shortage for 4.4 million people and 2.2. million livestock. RMB 187 billion (21 billion euros) of emergency funds have been earmarked. As stop-gap measures, authorities are diverting water from the Yangtze and Yellow River to drought-ridden areas, as well as shelling the sky with pellets to induce rain, Beijing Olympics-style. The water diversion measure has been able to get half of the wheat lands irrigated, but is rather ironic given that a recent study shows that 82% of China’s whopping 3.57 million square kilometers of degraded lands (equivalent to the size of 10 Germanys!) exists in the Yangtze River and Yellow River valleys. 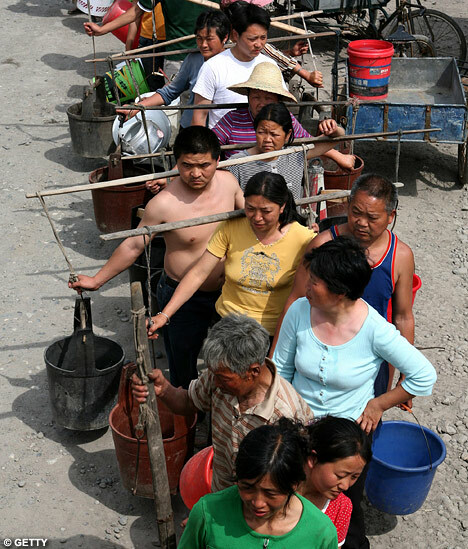 The water scarcity woes of northern China have been well described on this blog by Christine Boyle. The World Bank also chimes in with its own comprehensive list of policy recommendation to address water scarcity. The timing of the rural drought couldn’t be worse–20 million migrant workers are being repatriated from the cities due to insufficient jobs. The government is pledging its full support (of course it would, its legitimacy depends on maintaining social order) through a variety of social security schemes. GLF just wishes that these schemes would focus more on regenerative agriculture and soil rehabilitation and less on promoting conspicuous consumption and subsidizing consumption of electrical appliances! Moving from the water quantity issues to water quality issues, Frost & Sullivan is saying that the water treatment industry is going to be one of the biggest beneficiaries of China’s economic stimulus program. RMB 350 million is slated for environmental projects this year, with much of that reportedly targeting the water industry. Meanwhile, Guangdong as opened a pioneering “zero wastewater discharge” power plant. How’s this for another pioneering concept–WSCOs, or water service companies, modeled after energy service companies (ESCOS), to seal those leaky pipes. After almost a decade of investment, 61% of rural Tibet now has access to drinking water. Two clean up drives for recent water pollution disasters–Songhua River and Taihu Lake are reportedly to be progressing satisfactorily. Of course, government-controlled news feeds are not the most objective sources of these kinds of information, so who really knows? BBC has covered the Chinese government deciding to openly confront the impacts of worsening drought – climate change in other words. See BBC, China declares drought emergency for details. The government’s new openness about climate change impacts comes on top of recent, massive layoffs of Chinese factory workers. Business Week spells out the bleak aspects of falling demand for exports to the US and EU. (…) It is the rural poor of China who are hit the hardest by these overlapping trends: crops failing and no jobs in the city to fall back on. What could possibly be “good” about that? (…) Government openness about environmental matters is all to the good. Nations of the world, better able to understand these harsh realities, can no longer claim that by simply changing foreign policy or by better managing currency valuations that all will be made well. A much broader view is needed. (…) Sustainability requires simultaneously keeping three things in balance: economics, natural resources, and social interests (includes public health). To date, the world has cared little for management of China’s natural resources or for the health of its factory workers. For corporations dependent upon outsourcing manufacturing to China, now is the time look at their respective roles in creating a sustainable future.. The same goes for the Chinese government, which, until now, has pursued an economic-growth-at-all-costs policy, waiting for the right moment to seek a balance with other factors. Be sure that I will keep you updated on this topic. So for this and for much more, stay tuned and don’t hesitate to subscribe!